RichRelevance®, the global leader in omnichannel personalization, and CNET Content Solutions (CCS), the leading provider of ecommerce product content, data and solutions, have renewed their strategic partnership to enhance cross-sell and upsell for retailers. The partnership enhances the independent Relevance Cloud™ personalization platform with CCS’s DataSource™ product, the industry’s most comprehensive database of consumer electronics product information on more than 10 million SKUs, to allow merchants to curate a personalized shopping experience that includes the most relevant complementary products and accessories to consider at the time of purchase. Now retailers using the Relevance Cloud can inspire consumer purchase with perfectly matched products – while eliminating manual product mapping and the cost and effort of keeping up to date with inventory and trends. With DataSource, the Relevance Cloud algorithms optimize cross-sell and upsell by accessing timely, accurate and consistent information on 10 million Consumer Electronics product SKUs in 32 markets and 23 languages. 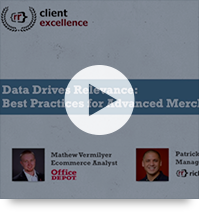 These Advanced Merchandising capabilities provide a supplemental layer of product intelligence to RichRelevance’s personalized product recommendation solution, Recommend™, enhancing real-time behavioral recommendations with attribute and compatibility-based capabilities. Product attributes such as brand, style, dimensions, compatibility, technical specifications, pre-installed software, and manufacturer warranty information are among the data that can be used to create new recommendation strategies for perfectly matched products. Using deep product profiles from DataSource™, the Relevance Cloud matches products by specific attributes such as key selling features, price points, and technical compatibilities, placing brand affinity directly at the merchant’s fingertips. The Relevance Cloud’s wealth of data ensures that an appropriate variety of accessories (e.g., computer peripherals, or an outfit) are matched intelligently to the base product’s characteristics. It also surfaces compelling alternatives within retailer-specified parameters (for example, products with higher-grade feature sets priced within 20% of the base product). Merchants have full control to adjust rules to change or support brand affinity, product assortment, user experience and vendor partners; extend or override behavior-based rules; or create custom rules to be applied at any level (SKU, category, or catalog). Since 1999, thousands of companies have turned to DataSource for the standardized product data to power their online websites and helps convert shoppers into buyers. With product coverage in 32 markets and 23 languages, DataSource is a world-class leader in standardized product data. Some of the top retailers in the world use DataSource every day to manage their online product catalogs. Today, we’re happy to expand our product recommendations capabilities with Advanced Merchandising. Now, you can present product ensemble recommendations to inspire consumer purchase with perfectly matched products. We’ve eliminated cumbersome manual product mapping, along with the need for your merchandisers to keep recommendations up to date with inventory and trends. You can now leverage existing data within the RichRelevance dashboard to create new recommendation strategies that group products by attributes or compatibility. Advanced Merchandising makes recommendations more relevant, intelligent and personal. Mobile and online shoppers demand—and deserve—the same personalized attention found in a brick-and-mortar store, where sales associates recommend what shoes and accessories to pair with a fall season dress, or which brand of headphones are most compatible with iPhone 6. Office Depot is successfully using Advanced Merchandising to connect consumers with their perfect match. You can watch this webinar to learn more. To inspire you, read on for a few ways that RichRelevance customers are already using Advanced Merchandising. Complete the look: Fashion complete head-to-toe looks with recommendations based on the latest trends and shoppers’ own personal styles. Don’t forget accessories: Recommend compatible accessories and warranties to consumer electronics or office supplies shoppers. Discover the long tail: Aid shoppers in discovering relevant new products that rarely surface with top sellers or other commonly used strategies. Through our exclusive partnership with CNET Content Solutions, consumer electronics retailers benefit from CNET DataSource™, a database that contains over five million technology and consumer electronics products that leverage specific product attributes such as key selling features, price points, and technical details. Learn how a top-20 consumer electronics retailer gained a 3% increase in revenue per session using Advanced Merchandising with DataSource™ to recommend compatible products. To present perfectly matched recommendations using Advanced Merchandising, get in touch with us now!